Government MP Marlene Farrugia has resigned from the Labour Party and parliamentary group. Dr Farrugia told timesofmalta.com she has also resigned as chairperson of the permanent committee for the environment and planning. In comments this evening, Dr Farrugia said she would remain an MP because she wanted to remain the people's voice. "I represent those who voted for the Labour movement hoping for a dignified, transparent and honest government..."
She said she did not wish to see the Labour government taking the route taken by the previous government. She handed her letter of resignation soon after she voted with the Opposition on two amendments on the Environment Protection Act. In her resignation letter, which Speaker Anglu Farrugia read in Parliament, Dr Farrugia express her wish to remain a member of the Development and Planning Committee. Referring her to the Standing Orders, the Speaker told her, she would have to be nominated by the Opposition. Dr Farrugia said this may be the time to update the Standing Orders so that MPs who felt that to represent the people honestly and with integrity they could not form part of the government or the Opposition, would be able to participate fully in the Parliamentary institutions. Opposition whip David Agius noted that all MPs could attend committee meetings. Speaker Farrugia said Dr Farrugia wanted to retain the right to vote. Dr Farrugia said that another issue which would come up was when there were debates she wanted to participate in. She said she would ask for time from both sides of the House and she who gave her that time at the beginning of her speech. 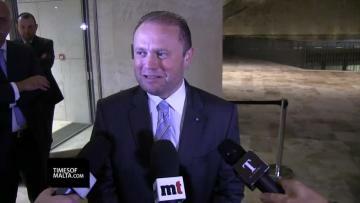 In comments to the media tonight, Prime Minister Joseph Muscat said there was no acrimony between the Labour Party and Dr Farrugia. "She is a free thinker and says what she thinks. I am a free thinker and say what I think." In a tweet, Opposition leader Simon Busuttil said the movement built by Prime Minister Joseph Muscat had started to crack and people were beginning to see through him. In comments to the media later, Dr Busuttil said Dr Farrugia's resignation was no surprise considering that Joseph Muscat's movement had been built on a lie. One of the amendments Dr Farrugia voted for, moved by environment shadow minister Marthese Portelli, proposed that three members on the new Environment Authority’s board be chosen by environment non-governmental organisations. The government contested the amendment saying, however, it did not have a problem selecting members from NGOs and would give consideration to the NGOs views. In the other amendment, Dr Portelli proposed that the nomination of the chairman of the Environment Authority should be approved by Parliament after a hearing at the Standing Committee on Environment and Development Planning. Dr Farrugia said the votes dealt with the Labour Party's proposals for transparency and accountability. "The current moment is a significant opportunity for the environment that is at the crossroads. The government is missing the opportunity to move away from the former opaque governance." In a statement, the Labour Party said the Prime Minister accepted Dr Farrugia’s resignation from the parliamentary group and the party. He thanked Dr Farrugia for her work within the party in the past and wished her well for the future.